While on an extradition job in Sacramento, Dragon is involved in a battle with the time-travelling superhero WildStar. An explosion rings out during the conflict which causes the army to charge in and ship the police officer away before he can learn too much about the incident. Dragon confronts a superpowered mass murderer going by the name the Shrew but he underestimates his opponent and the Shrew manages to escape. The hero returns to the police station where he begins to lose faith in his best friend Frank Darling as he rightfully suspects that he is purposely keeping him away from the real action. Dragon then returns to the depressed state he has been in since his first girlfriend Debbie Harris was murdered a couple of months ago by her ex-boyfriend. He visits a superhuman bar where he defeats a few members of the Vicious Circle before listening to the news. Reports come in that eighteen months after his much publicized death, Mighty Man has been sighted over the city. Singer/actor Peter Klaptin then gets a mention for losing his trademarked long hair to a fire of unknown circumstances. Dragon welcomes the news of the reappearance of the homicidal maniac the Shrew. Dragon tears into his foe using a pair of chainsaws for extra protection and is soon lost to his recent anguish and stops himself from killing his target, standing over his motionless and bloody body. He pulls himself together and returns to headquarters where he is sent to investigate a superpowered couple living under the city in the abandoned buildings that were built over years ago. Dragon reluctantly helps out the New York police department in catching a being who has been capturing elderly people, whose bodies are later discovered, apparently drained of all life through an unknown means. He is attacked by the quartet of Ninja Turtles, who had also been stalking the animated gargoyle. The man is short lived when Dragon threatens to arrest his foes and they realize their mistake and recognize him as the ’famous freak cop from Chicago’. All five of the heroes decide to pool their resources and begin their search for the murderous being of stone. As the heroes move across the rooftops, the creature attacks them and withstands the attacks from the Ninja Turtles and uses its fire-breathing abilities to hold them back. Dragon is left alone and leaps through the flames and shatters his foe with a single punch, questioning how such a creature could even exist. The sorceress responsible, Virago, quickly tries to make a getaway before she is discovered and arrested. Dart and her new police colleagues do their best to contain the escaping supervillain populace and are quickly overpowered. Star arrives on the scene to lend a hand but with no superheroes about, all seem certain to die. Cutthroat charges through the prison cells and notices Hardware whom he quickly shoots dead for trying to cop a plea for giving evidence on his employer. All of a sudden Mighty Man bursts onto the scene after apparently returning from the dead. He saves the life of the two costumed humans before refusing to go after the escaped felons. Dragon returns from New York City and learns of his new costumed teammate, and that she had been shot in the shoulder during a prison breakout. Dart states that he should never have left Chicago, despite his orders. The Vicious Circle once again contact their blackmailed ally and threaten to harm Frank Darling’s wife, who is now pregnant with their first child, if he doesn’t get his superpowered recruit to back off their operations soon. Ray Wong informs the fin-headed hero of the crazy elderly woman who keeps claiming that he is her son, and the police station is also taking a lot of phone calls from Amanda Mills. News of a leech-like creature having been found and removed from the base of the Shrew’s neck indicates that his rampage may not have been his fault. Arnold Dimple, the man who shot dead his own ex-girlfriend Debbie Harris by accident before taking his own life, received a thirty minute phone call from his victim’s mother. Dragon arrives at the crime scene to discover a young spiky-skinned freak woman chained to the basement where she had lived all of her life, the television her only real company. He breaks her bondages and takes her to the police station to recover from starvation and dehydration. Frank Darling takes his wife home from the hospital after she had been ’accidentally’ knocked down an escalator, which broke her leg, but did not harm the baby. 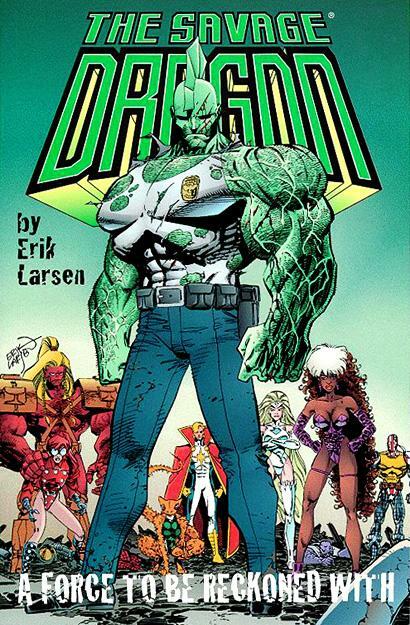 Captain James Stewart announces his plans to form a superpowered team within the police force and places his two current operatives on the team before recruiting Horridus, the now-recovered freak girl with a diminished mental capacity. After rejecting his obsessed stalker, Dragon is asked to consider some more members of his new team. He recalls the two youths he had encountered in the sewers a few months ago, when a call comes in stating that a superpowered fight has broken out in the underground. A news report reveals that Chris Vantage, the Shrew, has been cleared of his mass-murders a few months ago due to the discovery of the leech-like creature on his neck. An alien left by Supreme is being held within the Chicago police department. SuperPatriot has attacked the Pentagon and seems to be under mental control. R. Richard Richards, the publisher of the Chicago Voice newspaper has voiced grave concerns over the police force’s superhuman team. And finally, the incarcerated Peter Davidson, who goes by the supervillain guise of Cesspool, is suing the police for excessive force used in his arrest. The Annihilators tear apart their foes through superior strength and numbers and would likely succeed in killing at least some of them if the arrival of Mighty Man had not scared them off. The villains all head for a teleportational device that Barbaric destroys, possibly scattering their atoms across the universe. CyberFace, the leader of the rogue supervillain faction, is taken into police custody and asked to give evidence against his own target in exchange for his freedom. Emily Schwartzblatt finally meets up with the man she believes is her son Rodney who she has not seen since 1986. Despite photographs that show a certain likeness, their is no real evidence so Dragon dismisses the claims. Vanguard lies unconscious in his prison cell after his recent capture. After a number of city-directions to their conduct, Freak Force decide to leave their police sponsors to strike out on their own. Their leader refuses to join them as his first loyalty is to his fellow officers. Mighty Man reveals to the only person he trusts that he is not the original hero but recently discovered that they had been passed on those powers.